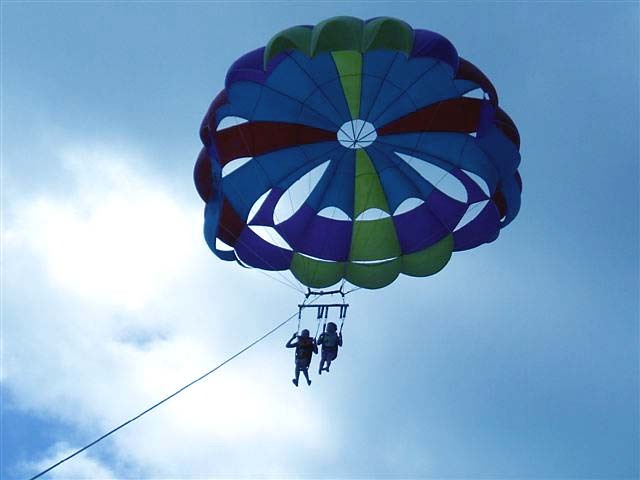 Ever wanted to experience the thrill of flying 500 feet above the sea? 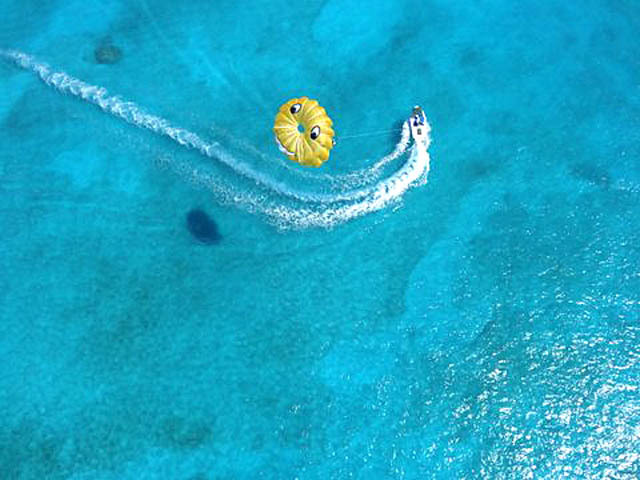 With no experience or skills necessary, you can experience one of Grand Turk’s favorite activities. Our grandma does it every year on her birthday, and she’s well into her eighties. We are fully licensed and insured, native owned and operated, and have been hosting happy customers since 2004. 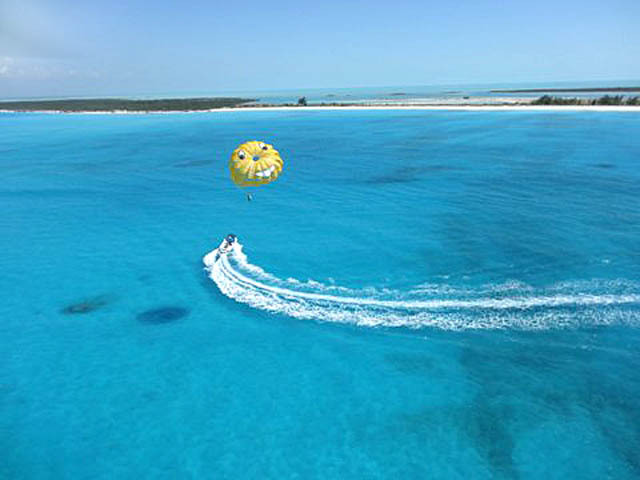 Grand Turk is an ideal location for parasailing. 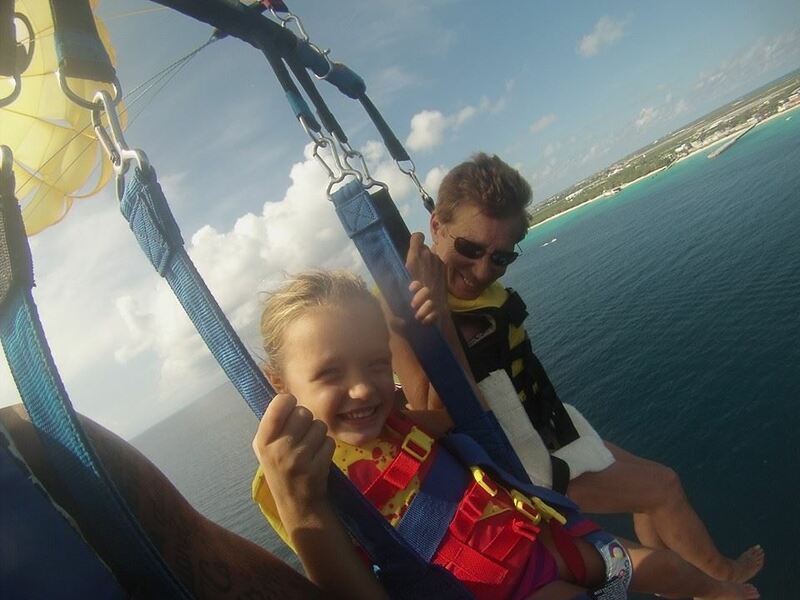 Come Fly like an Eagle and experience a birds-eye view of the island. 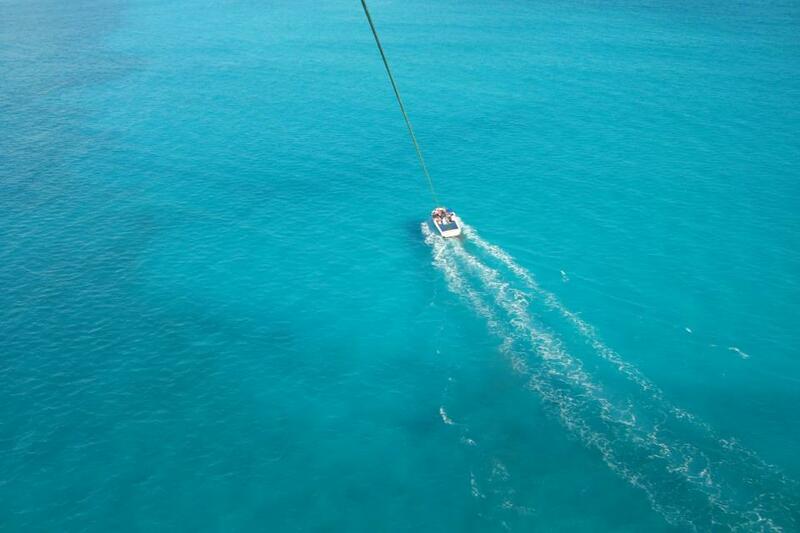 From 500 feet above the water, the only sound you will hear is the wind whispering in your ear. 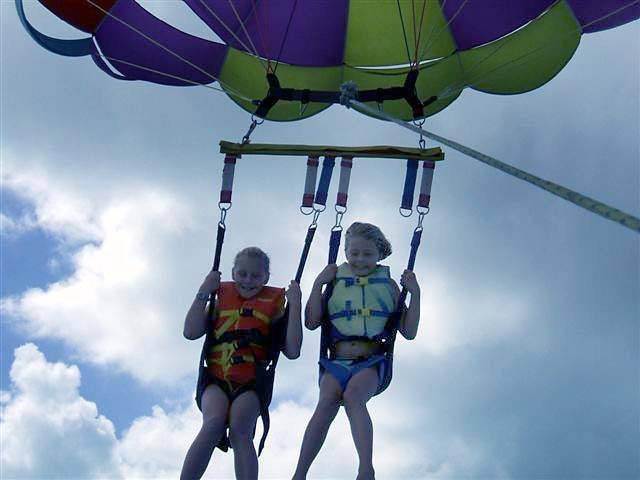 Let us add a new dimension to your cruise and show you how safe, relaxing, and fun a parasail ride can be! Before you fly, we will provide you a safety briefing that will explain take-off and landing procedures and how to communicate from the air. 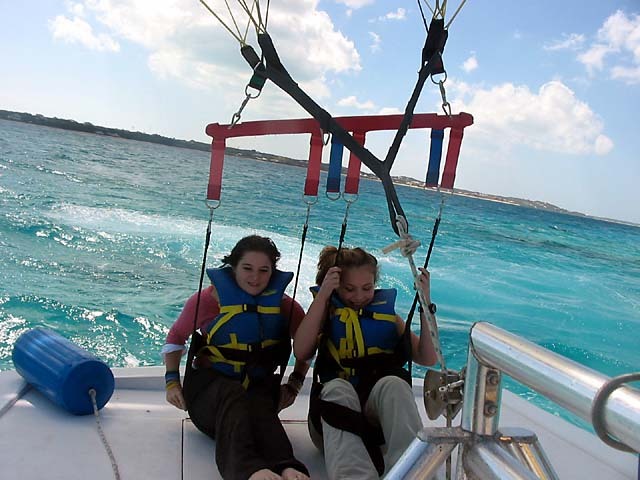 Once we harness you into the parasail canopy, you will launch directly from the boats specially designed flight deck. The flight lasts about 6-8 minutes, topping out at a height of approximately 500 feet. 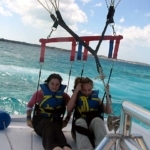 You will enjoy a unique view of Grand Turk’s beautiful beaches, reef formations, the drop-off into the Abyss, and even catch a glimpse of the far side of the island. You will land right back on the boat’s flight deck, where our crew will unfasten the canopy and guide you back to your seat. 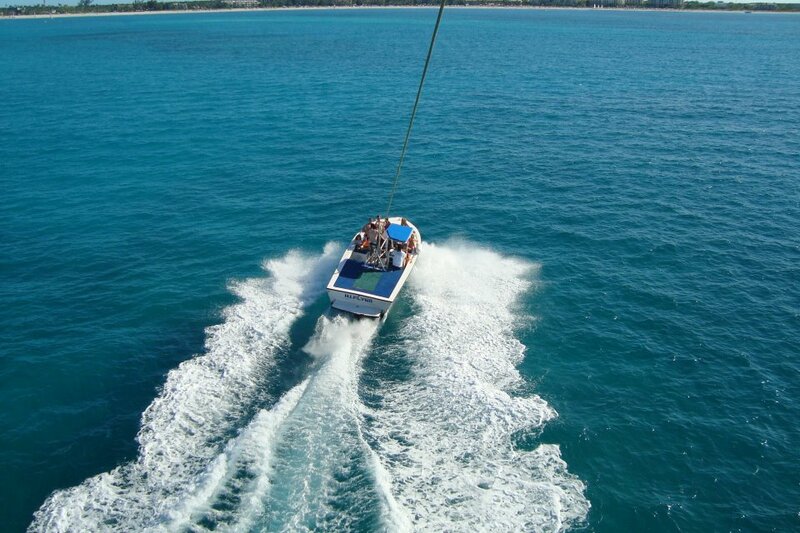 Our premium parasail boat was designed and built specficially for parasailing. The maximum capacity of the excursion is 12 guests. 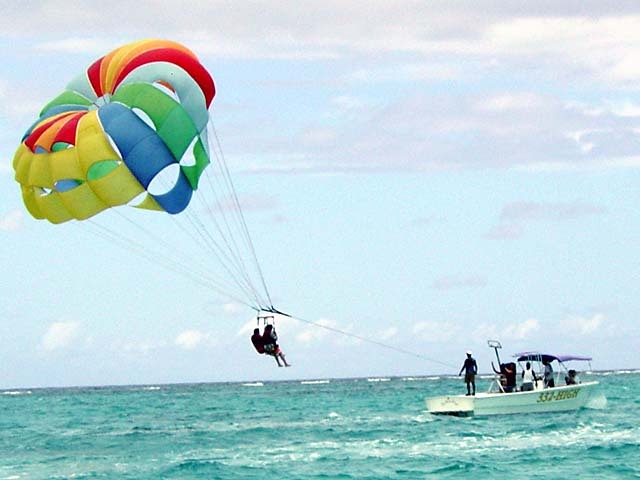 The maximum combined weight for you and all parasailers on your flight is 450 lbs. (The maximum weight could be less depending on wind and sea conditions.) 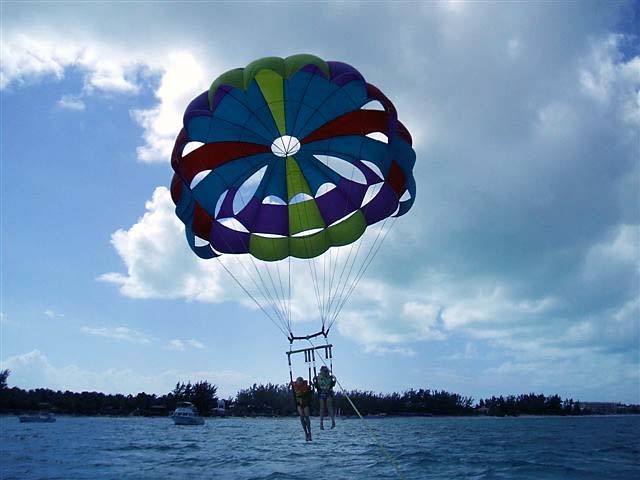 For safety reasons, people with back or neck injuries, heart conditions, and pregnant women are not allowed to parasail. 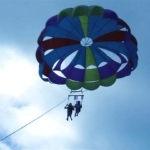 When conducted by a well-trained crew utilizing the proper equipment and operating in good weather conditions, parasailing is a safe, fun, aerial adventure. Are different types of equipment safer than others? 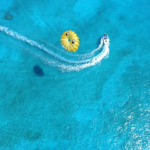 Comparison studies have shown that there is an increased risk utilizing certain types of equipment, but generally speaking parasailing with an experienced captain, using well-maintained equipment, and flying only in good weather conditions are the most important factors relating to safety. We use the absolute best equipment and follow all manufacturer recommendations for the use of their products. Our winch rope is double braided 7/16-inch Esterlon with a special coating to protect it from the elements. We change the rope every 9 months or at the first sign of stress, wear, or fraying of any kind, whichever comes first. Is there a training course to learn how to parasail? It is customary for the equipment manufacturer to provide training. As an alternative, experienced captains may serve as private instructors. Our captains are professionally trained, have at least 10,000 flights with us, and at least 50,000 flights before they came to work with us. 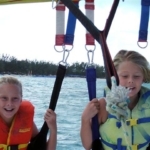 What are the known risks and inherent dangers of parasailing? The most common accidents occur during tow line separation from the boat, equipment failure, high speed water and deck landings, canopy rotation, line popping, and whiplash. Safety is and has always been our first priority. We are serious about the maintenance of our equipment and have not suffered any major accidents or equipment failures. 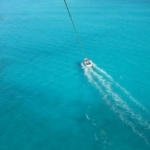 What is the safest altitude to parasail? There are many factors involved in arriving at an exact figure. 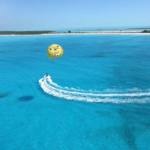 The United States Parasailing Safety Council advises, as a general observation, that the maximum altitude for large lakes and open ocean should not exceed 800 feet. (For bays and small lakes, the maximum recommended altitude is 300 feet.) We limit our tow line length to a maximum of 600 feet. 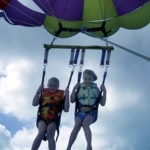 What are the requirements or qualifications to operate a parasail boat? 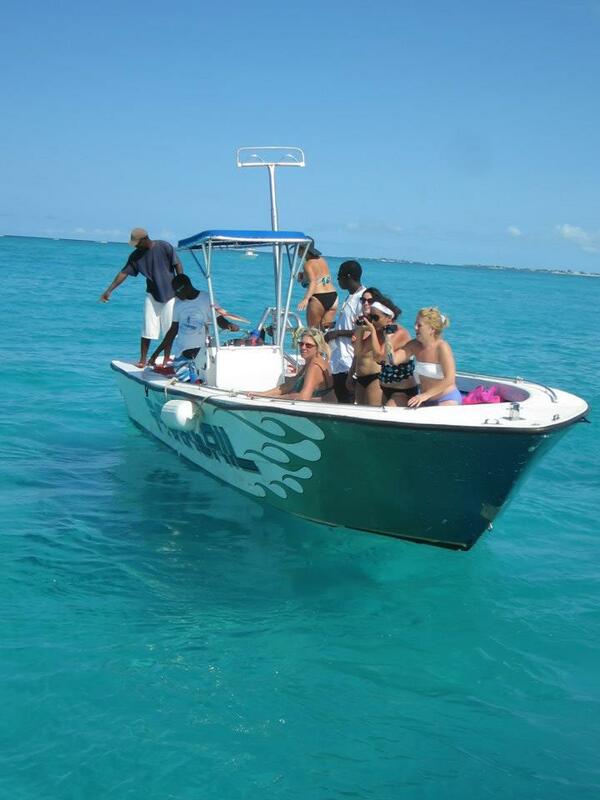 To legally take passengers for hire or charge money in the Turks & Caicos Islands, an operator needs a business license and a Captain’s License from a reputable licensing agency. 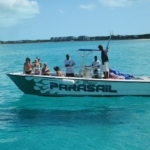 Our Captains are licensed directly through the Turks & Caicos Maritime Department, although the licensing course is conducted and examined by Sea School of Florida. What are the minimum requirements to obtain a Captain's License? To obtain a basic license, one must have a certain level of boating experience, pass a course in basic firefighting and survival at sea, and pass a written and practical exam that covers seamanship and boat operation. A Captain must be at least 18 years of age. 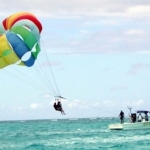 Does a USCG (U.S. Coast Guard) Captain's License qualify one to act as a parasail operator? No. 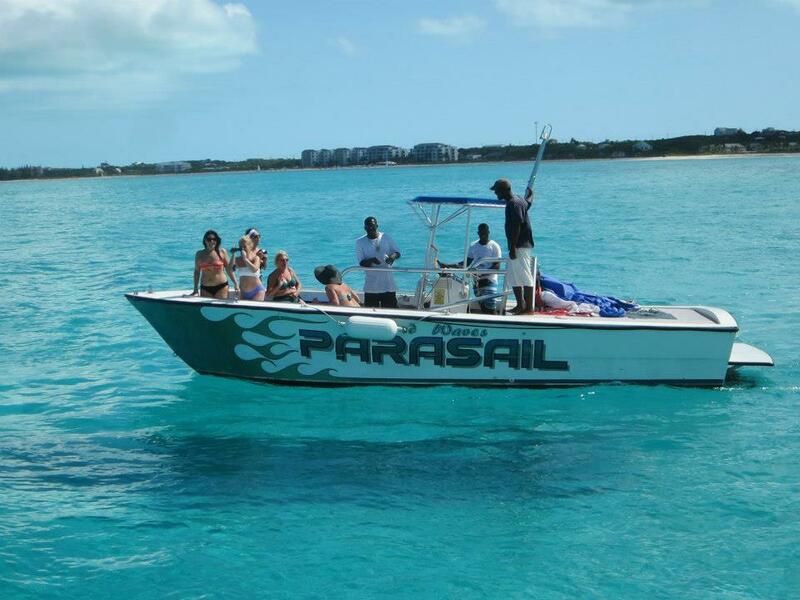 There are currently no licensing requirements, qualifications, or industry standards to become a parasail operator. 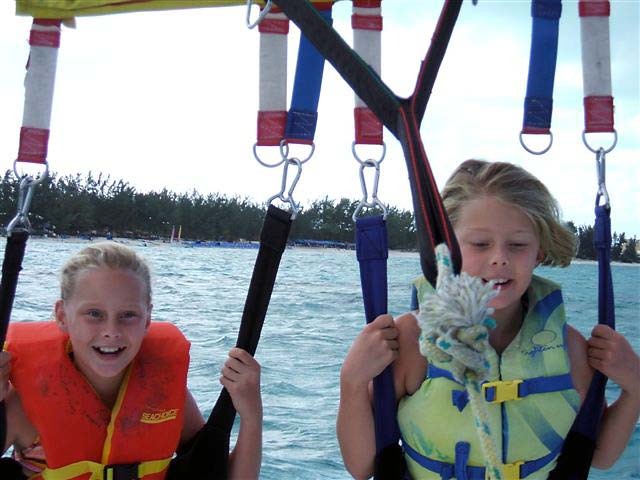 This is one of the dilemmas of commercial parasailing. While operators enjoy their independence, this freedom comes with some risks. 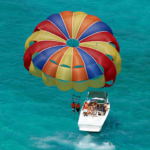 Why doesn't the USCG require a special license for parasail operators? The jury is still out on this question. In the meantime, the public needs to understand that parasail operators can fly by their own rules and make up new ones as they go along. Generally speaking, the majority of operators are responsible and have enjoyed a strong safety record. Why do operators use advertising slogans such as: a) Our Captains are licensed by the USCG; b) Our equipment is always new and checked daily by our USCG Certified Captains; c) Everything is double checked by our USCG Certified Captain to ensure a safe flight every time; d) Our parasail boats are inspected vessels certified by the USCG; e) We are endorsed by a major hotel; f) We are a member of a maritime association? Slogans such as these are often misleading in that they imply that the tour operator, the Captain, and/or their equipment are somehow sanctioned by the USCG. In reality, a Coast Guard Captain without training in the sport of parasailing knows as much about parasailing as I know about piloting a space shuttle. What is the difference between a vessel inspected by the USCG vs. an un-inspected vessel? An inspected vessel requires the manufacturer to follow building specifications and has nothing to do with the operation of the boat. The USCG overseas the construction of the boat until completed. In some cases, a stability test is performed to determine the number of passengers the vessel can carry. (Note: 90 percent of all reputable boat manufacturers build boats that would probably meet USCG specifications). 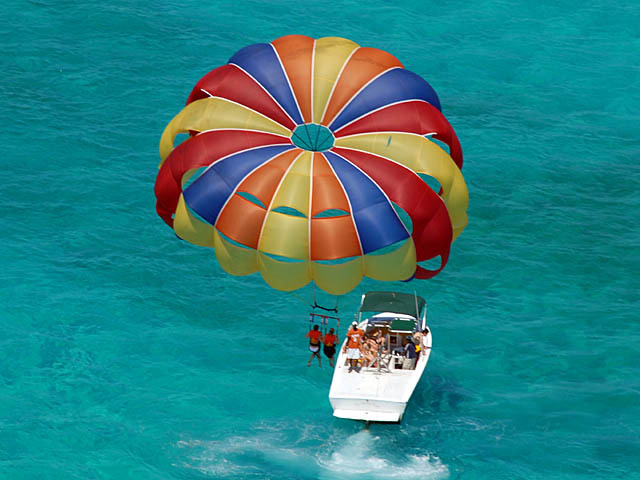 However, there are no USCG requirements for parasail vessels with regard to the parasailing equipment onboard. 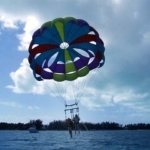 Price: $90 per person for solo, tandem and triple flights. Schedule: Daily flights year round. Duration of Tour: One hour on the boat. Seven to eight minutes in the air per flight. Refund Policy: Your deposit is fully refundable if you cancel your reservation at least 30 days before your activity. If you cancel your reservation within 14-30 days before your activity, we will refund half of your deposit. Cancellations within 14 days of your activity are not refundable. Of course, if weather conditions or other factors force us to cancel your reservation, you will receive a full refund. If your Cruise Line changes its itinerary due to weather and does not call into Grand Turk, you will receive a full refund. We encourage all of our guests to safeguard their vacation plans by purchasing travel insurance. Your tour leaves from the beach next to Cruise Centre. You walk past Margaritaville beach area, to the end of the swimming zone where you will see boats on the beach. This is in front of the White Sands Resort and the Casino.